Make this: Pumpkin, mushroom, tahini & wild rice stuffed capsicums. You know what happened on the long weekend? I went on a road trip to see the 12 apostles (for the first time ever). After a planned lunch at the Timboon Railway Shed Distillery where we enjoyed a meal full of local produce, this little road trip turned into a food tour along on the 12 Apostles Gourmet Trail. I highly recommend you do it. There was a stop at the Timboon Cheesery (formally the Mousetrap Café) where they sell the most delicious organic natural yoghurt, a stop at Apostle Whey Cheese to pick up some brie & a had to be done stop at GORGE chocolates. Their mint milk hot chocolate is amazing. But as you can imagine after all this deliciousness & lunching on antipasto, slow cooked lamb toasties & whisky cured salmon, this dietitian had only one requirement for dinner. Some vegetables. 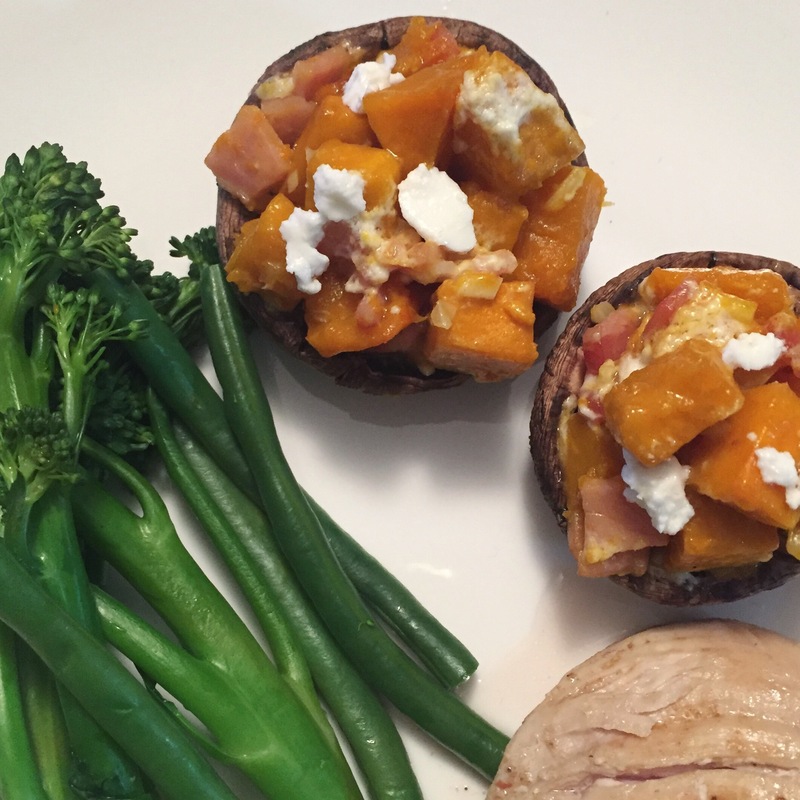 I had come across this pumpkin & bacon stuffed portobellos with browned butter sage recipe featured on the Australian Mushrooms Instagram feed a while back. After a show to the protein fiend, it was only seconds before we had dinner planned. It was a great idea. Such a great idea. In fact, it was such a delicious combo, it increased my desired for stuffed vegetables. The protein fiend had whipped up this amazing middle eastern inspired black rice salad the previous week (and used quinoa too) & because it has pumpkin and mushroom in it, I immediately thought stuffed capsicums. So it seems I not only stuffed my faced, but I also stuffed a whole lot of vegetables on the weekend. Balance hey? Pumpkin, mushroom, tahini & wild rice stuffed capsicums. The juice of one small lemon. 1. Preheat oven to ~180 degrees. Slice across the top of the capsicums (about 1-2 cm down). Place capsicums, cut-side up, into a shallow baking dish & cook for approximately 20 minutes. 2. Place diced pumpkin on lined baking tray/dish, spray with oil & bake in the oven for about 20 minutes or until tender (I gave mine a buzz in the oven to speed up cooking process). 3. 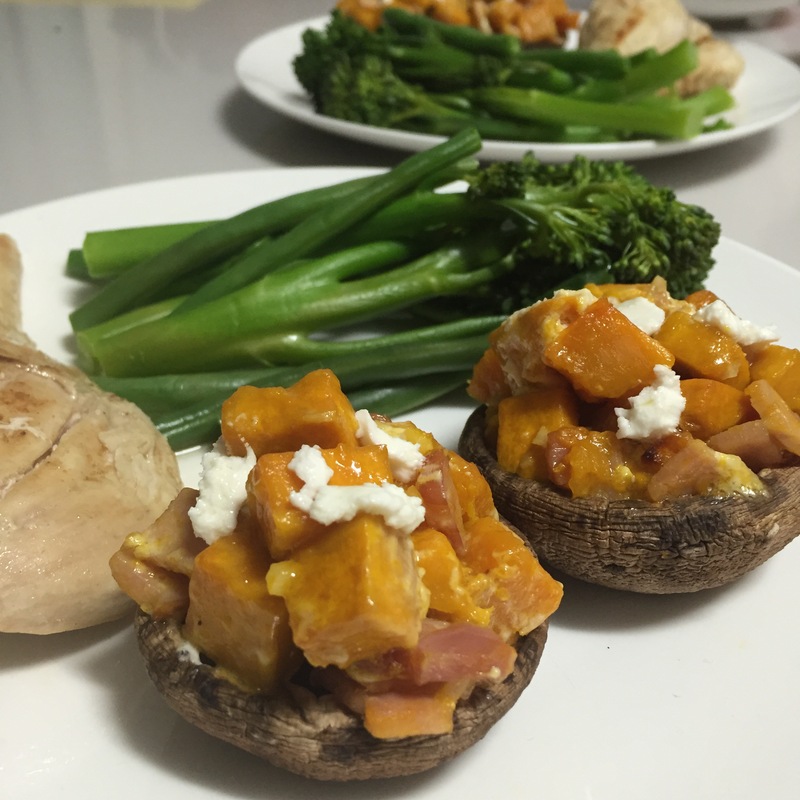 When pumpkin is almost cooked, place mushrooms in a non-stick pan and cook for approximately 3 minutes (the natural juices will start to develop). Add the garlic and bacon, and cook till crispy. 4. Prepare wild rice mix as per instructions. In the meantime, combine tahini, lemon juice, olive oil and honey in a bowl (If not overly runny, add water or oil). 5. In a bowl combine rice, pumpkin, mushroom mix and dressing. Add feta & almonds and gently combine. 6. Fill each capsicum with the stuffing & return to the oven for approximately 10 minutes. 7. We served ours with some souvlaki style lamb & blanched greens. Enjoy. < A blogging birthday: the (not so terrible) terrible twos.